(CelebrityAccess MediaWire) — As the layoffs and resignations continue at Clear Channel Entertainment, Michael Rapino said the final spinoff will be completed by the end of the year. 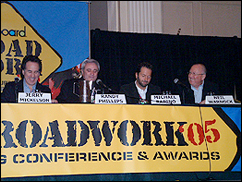 Rapino addressed the spinoff publicly at the Billboard Road Work ’05 Touring Conference and Awards last week in New York. Specific movement in the company recently included the resignation of CCE-Music’s former vice president of festivals Frank LoPresti to form Clutch Entertainment Group. Office closings during October included most operations in Minneapolis and Milwaukee, with staff members such as Alex Kochan being transferred to other locations. Pace Concerts’ Austin office was also closed permanently, but the Houston and Birmingham operations are still in tact. There were rumors of Jason Wright leaving the Nashville Pace office for Washington, D.C., but there has not been any movement in that arena as of yet. Individual layoffs have included Eric Herz at Avalon Attractions in Beverly Hills, and Brian Drusky of Belkin Productions in Pittsburgh.